As our colleagues at io9 reported, Miyazaki is keen to come out of semi-retirement to make one last feature film. Back in 2013, he officially announced that he would no longer make full-length movies. Since then, he’s worked on other projects, including a short film called Kemushi no Boro, which he now hopes to expand to a full-length film. A recent NHK special showed how Miyazaki has been spending his time. When it starts, Studio Ghibli’s production studio is empty, as it was dissolved back in 2014. But during the course of the TV special, it begins teeming with life. 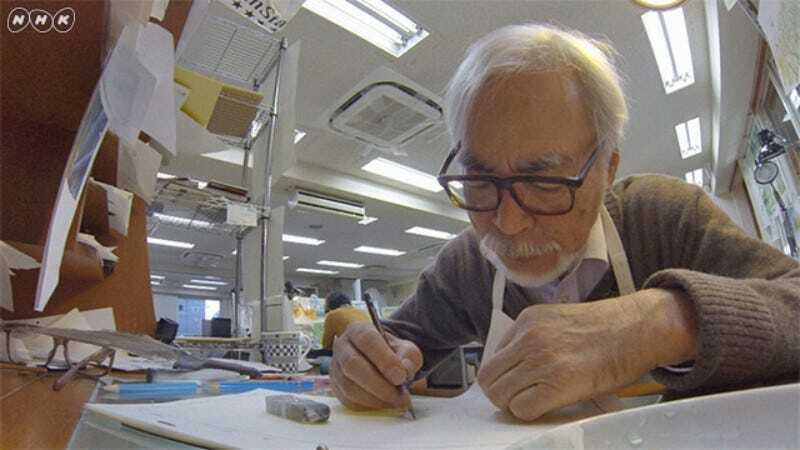 In one scene, Miyazaki learns to use a tablet for animation. This is a big deal, because for most of Miyazaki’s life, he’s been, well, analog. “Until now, I’ve never thought about touching a computer,” says Miyazaki. The subtitle says that if he touches here, then it will cause the animation to move. “Huh? What? An eraser,” says Miyazaki. It also shows that Miyazaki is still infamously picky about quality. At the end of the documentary, Miyazaki gives Studio Ghibli producer Toshio Suzuki a pitch for a feature film. His handwritten pitch includes a schedule, which lists pre-production until the middle of next year, and production until early 2019, releasing the film before the Tokyo Olympics. Suzuki says Miyazaki might die during production, while another Ghibli staffer off camera said, “Then it will be a big hit.” Suzuki then begins cracking up, laughing.